That’s a fact Mapping Prejudice project team member Kevin Ehrman-Solberg outlined at the 2018 Sowers of Justice Assembly at the University of St. Thomas in St. Paul Feb. 12. And communities, he said, are still affected by its repercussions today. Co-sponsored by St. Thomas and Catholic Charities of St. and Minneapolis, the event invited its more than 200 attendees to explore the issue. It opened with a presentation from Mapping Prejudice, a project team in Minneapolis that has explored roots of racial inequality in housing. 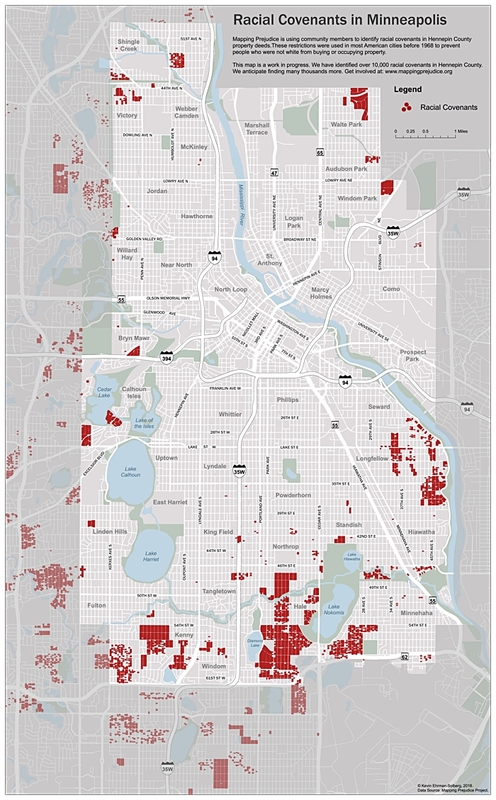 Using Minneapolis maps, Ehrman-Solberg demonstrated that between 1910 and 1940, housing options for people of color evaporated in certain parts of the city, while segregated portions grew. Racial covenants on home deeds made it possible for homeowners and realtors to prevent people of color from owning homes in certain neighborhoods. And while the maps examine history, they’re helpful now. A program of Catholic Charities, Sowers for Justice explores and addresses racial injustice in Minnesota. Catholic Charities has long work to address housing issues. Catholic Charities also took another step to advance the cause with Acooa Ellis, its director of social justice advocacy, becoming a co-chair for the Governor’s Task Force on Housing. Initiated by Gov. Mark Dayton in December 2017, the task force works to improve housing opportunities for all Minnesotans. At the Sowers for Justice Assembly, Ellis guided the panelist discussion that followed Mapping Prejudice’s presentation. She noted that 2018 is the 50th anniversary of the Federal Bureau Housing Act, which offered “protection against overt housing discrimination” though the “disparities in who experiences homelessness in our community” continue. “Those challenges are exacerbated by today’s tight housing market and make tougher the work to move our clients toward housing stability and connect them to pathways out of poverty,” she said. Panelists explained that people of color often fall into one of two situations with housing: Either they remain stuck in a neighborhood that doesn’t have the advantages of a predominantly Caucasian neighborhood, or people of color end up finding a place in the metro suburbs and find themselves displaced from their culture. “They want feel like they belong, so we don’t just uproot people to make change,” said Ann Gabriel, 70, a parishioner of Christ the King in Minneapolis, who attended the event. Gabriel said she recalled the covenant Ehrman-Solberg described in her housing deed for her former south Minneapolis home near Lake Nokomis. That neighborhood became devoid of African-American residents in the first half of the 1900s, a trend in other parts of Minneapolis, too. Belz had been chosen for the four-person panel at the assembly because of a series of articles he wrote on the connection between housing and race. Panelists also included Marx, Ehrman-Solberg and Shannon Jones, executive director of Hope Community, a Minneapolis-based non-profit that advocates for affordable housing. Attendees also broke into small groups to discuss the challenges surrounding racism and housing. Through their discussion, members of Pax Christi in Eden Prairie came to a consensus that reaching out to the people of other ethnicities is critical in the process for correcting injustices. “Go to them rather than having them come to us,” said Mary Robinson, 72, a member of Pax Christi’s Just Faith group.